Dundee Royal Infirmary closed in 1998, commemorative plaques and other items from the infirmary were transferred to Ninewells Hospital which replaced the infirmary as Dundee’s general and teaching hospital. Since then the original building and the main later additions have been converted into housing, renamed Regents Gardens, completed in 2008 by H & H Properties. The original planning brief for the site was approved before the infirmary had even closed, in 1996. The masterplan was approved in 2000, amended the following year. The architects for the conversion were the local firm of Kerr Duncan MacAllister. Listed Grade A, the original infirmary, now Regents House, was the last of the former hospital buildings to be tackled. It was reconfigured to provide 63 apartments, with ground-floor flats some having individual main door entrances, and the high-ceilinged flats on the upper two floors featuring galleries looking over the living-rooms. Caird House (listed Grade B, built in 1902-7 as the cancer wing), was turned into 22 apartments and 5 pent-house flats; Dalgleish House, the 1890s nurses’ home, provided 19 apartments; Loftus house, which was originally the Caird Maternity Home and later a nurses’ home, was converted into six town houses; and the small Gilroy House was converted into two houses. This view of Dundee Royal Infirmary from the Law shows the former Cancer Wing, photographed in 2005 by TheCreator, public domain image on Spanish Wikipedia’s entry for Dundee. The old wash-house and drying green to the east of the infirmary was built up with housing as part of the redevelopment of the infirmary site. The wash-house itself had been demolished and replaced by the Constitution Campus tower of Dundee College in the 1960s (opened in 1970). By 2015 this was closed and awaiting redevelopment as flats with a cinema, gym, office space etc., known as Vox Dundee (why? who comes up with these names? I’m sure there’s a perfectly good explanation). 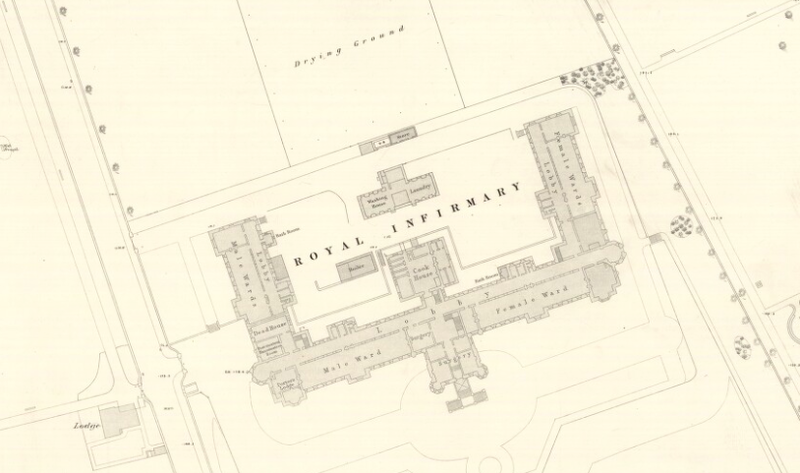 Dundee Royal Infirmary was officially opened on 7 February 1855, having been completed towards the end of 1854. It was designed by Coe & Goodwin of London. This building replaced the earlier infirmary built in the 1790s in King Street. By 1849 a committee had been appointed to select a site for the new infirmary and a competition was held for the plans. The eminent medical Professors James Syme and Robert Christison of Edinburgh were consulted in the selection of the winning design, and had also supplied a block plan of the necessary arrangements when designs were first invited. Although 30 sets of plans had been submitted by the summer of 1851, only three were considered acceptable and put on display. The Northern Warder was scathing in its criticism of the majority of the plans, which it thought must have been produced by ‘aspiring joiners’ hoping to win the £50 prize for the winning design. Coe and Goodwin’s design was for a hospital of three storeys on a U‑shaped plan. It was of the corridor type of plan which was generally current before the introduction of the pavilion‑plan. Indeed, it was built in the declining years of corridor-plan hospitals, lending irony to Professor Syme’s description of it as ‘a model after which institutions similar in kind might well be constructed’. It is a bold essay in the Tudor style applied to a large public building (claimed to be the largest public building in Dundee at that time). David Robertson, a local builder was appointed to erect the building and work was commenced in 1852. This more detailed plan is from the OS Town Plans, also of 1871. Reproduced by permission of the National Library of Scotland. 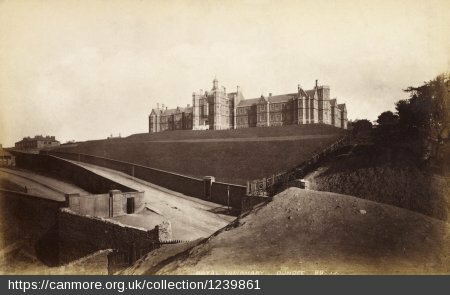 Many extensions were built and sister institutions provided, one of the first was a convalescent home at Barnhill built in 1873-7 (since demolished). Problems associated with the plan had to be rectified – the chief of these being the sanitary facilities. One of the key aspects of pavilion-plan hospitals was the placement of the WCs, sinks and baths in rooms that were separated from the ward by a short lobby with windows on each side. This created a through-draught and was designed to prevent ‘offensive effluvia’ from being carried into the ward – bad smells or miasmas that were believed to cause disease. Plans to improve these and to build a new wash-house and laundry were prepared, and other similar institutions visited so as to provide the best and most up-to-date conveniences. The plan of Dundee above marks the principal additions built to the north of the original hospital in the late 19th and early 20th centuries. These have been retained and converted to housing. To the left is the nurses’ home, built in 1896-7 and named after Sir William Ogilvy Dalgliesh, president of the hospital and benefactor of the University’s Medical School. On the right hand side is the Caird Maternity Hospital, designed in 1897 and opened in 1900, named after its benefactor, the jute baron (Sir) James Key Caird. Though marked here as a maternity hospital it served a dual function, with one block for maternity cases and one for diseases of women; the third, central block contained administrative offices and staff residences. It was designed by Murray Robertson. Caird also funded the cancer wing, built in 1902-7 to designs by James Findlay. The map above shows the extent of the extensions and additions to the site up to the 1950s, many of these were demolished following the closure of the infirmary. These included an extension to the west rear wing of 1895 providing a new operating theatre. Another building removed was the maternity wing, which had been opened in 1930, erected and equipped by R. B. Sharp and his brother F. B. Sharp of Hill of Tarvit, Fife (pictured below, and labelled maternity hospital on the map above). The architects were D. W. Baxter & Son. 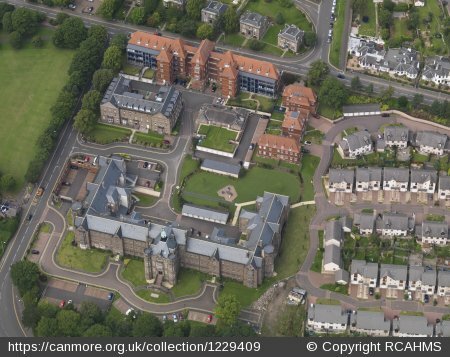 After it was built the former Caird Maternity Hospital was turned into nurses’ accommodation. A further addition providing new dispensary and pathology departments was opened in 1935, named the Sir James Duncan building. This entry was posted in General Hospitals, Scottish Hospitals and tagged Dundee, hospital re-use, Scottish Architecture, Victorian Architecture. Bookmark the permalink. I trained and lived in Dundee Royal Infirmary in the early eighties. I lived in an attic bedroom in Dalgleish Nurses home overlooking the park. I’ve worked in Ward 5 and Ward 5 (urology), also ward 7 and 9. How I wish that I had appreciated such a magnificent building and taken a photographic record of my time there. Thank you so much for providing this amazing narrative and photographs of a beautiful building. I often wish old hospitals like this were just preserved as they were, as museums. I am, however, grateful it hasn’t been demolished. I trained in DRI in 1967 then later Ninewells. This narrative brings back so many memories. I was born in DRI in 1949!! I was born at the DRI in Feb 1974, the last service to move over to Ninewells was OB.